Kowah is a rummy-esque game for two to four players, from the Indonesian island of Java. In this game, players try to form their eight-card hands into triplets—but winning the game requires holding three cards of the same rank and suit! The object of Kowah is to form a hand of a certain structure so that the player can make a declaration of checki. Then, the player must obtain a card of the same rank and suit as two others in their hand. Kowah uses a highly unusual 120-card deck. 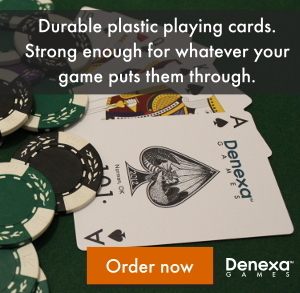 To build such a deck, start with four decks of Denexa 100% Plastic Playing Cards. From each deck, remove the aces through 10s of clubs. From the other three suits, remove the 10s and face cards. You’ll be left with two 30-card decks consisting of A–9♠, A–9♦, A–9♥, and J-Q-K♣. Shuffle these four 30-card decks together to form the full 120-card deck. Shuffle and deal eight cards to each player. Place the stub in the center of the table, forming the stock. The player to the left of the dealer goes first. They draw from the stock, then discard one card from their hand, placing it face-up next to the stock to form the discard pile. Upon discarding, the turn passes to the left. 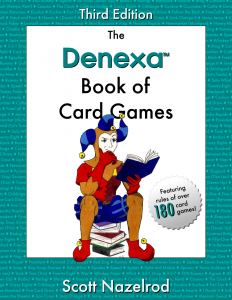 Thereafter, players may draw either the top card of the stock or the top card of the discard pile at the beginning of their turns. Two threes-of-a-kind (suits do not matter) and a pair of the same rank and suit. For example, 5♠-5♥-5♦-7♥-7♠-7♦-A♦-A♦. Three of a kind and a five-of-a-kind consisting of two pairs of the same rank and suit and one card of the same rank but a different suit. For example, 5♠-5♥-5♦-7♠-7♠-7♦-7♦-7♥. Upon forming one of these hands, they declare checki, and place the pair of identical cards face up on the table in front of them. (For a checki of the second type, they may place either pair face up.) These cards are still considered part of the player’s hand. After player has declared checki, each time an opponent draws from the stock, they must reveal the card they have drawn. If it is a third card matching the same rank and suit as two in a checki player’s hand, they may claim that card. Likewise, if a player discards a card that would be the third card of the rank of suit a checki player needs, they may claim that card out of turn. As play continues, additional players may declare checki and are then able to claim cards out of turn the same way. Game play continues until a checki player gets the third card they need. This player wins the game. If the stock is depleted before a player gets the card they need, the hand ends without a winner.